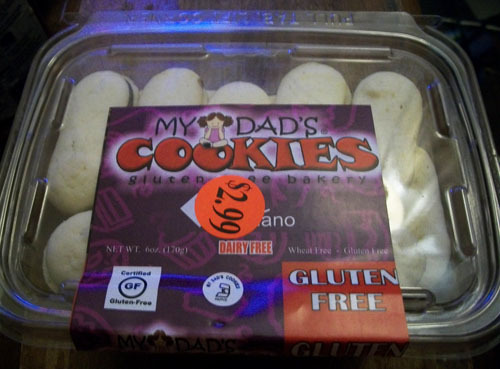 These My Dad’s chocolano cookies are a gluten free (also labelled wheat free/dairy free) cousin to the more famous Milano from Pepperidge Farm. These treats are an improvement however because they have the richness of a Milano but with a more delicate crunch and a slight crumbliness. The cookie is in perfect proportion to the chocolate filling. They’re made with white and brown rice, tapioca and potato starches. 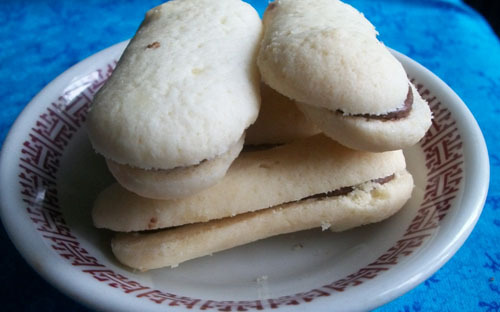 The rice flour comes across because it gives an airiness that a wheat based cookie might not have. There isn’t any coconut or almond among the ingredients but the chocolanos taste of both. I tested the cookies with coffee and it worked amazingly well. Note that these cookies do contain egg so they’re not vegan. My Dad’s are rich, the way a treat should be. While there were only 13 cookies to a box, you only need one to satisfy a craving. I would definitely buy these cookies again, in fact I already bought a backup box. All of My Dad’s products are gluten free though some vary in reference to egg or dairy. They don’t have a store locator by they do have a website here. Ha, ha, ha. You fooled me. I really thought you were talking about YOUR DAD! I thought he liked to bake cookies. Ha! Got me. Hhaha my dad doesn’t bake but he makes a mean omelette.